Beneficiaries living in Los Angeles, Riverside, San Bernardino, San Diego, and Santa Clara Counties will receive a choice form with their health plan guidebook, which they can use to make health plan choices. Beneficiaries living in San Mateo county will receive a Non-Auto Enrollment Form with their health plan guidebook. Draft samples of these forms are available below. Revised Sample Choice Book with Sample Choice Forms (county-specific) – The revised sample Choice Book and Choice Forms have been revised following beneficiary testing and stakeholder comment and will begin to be mailed to beneficiaries around their 60-day notice, beginning in September 2014. These forms were in use beginning in September 2014. Find blank, usable version of these linked above. A visual guide to filling out the Choice Form. This is posted online only. Beneficiaries do not receive this in the mail. These notices will be mailed to beneficiaries 90, 60, and 30 days prior to an individual’s scheduled date of passive enrollment into Cal MediConnect. 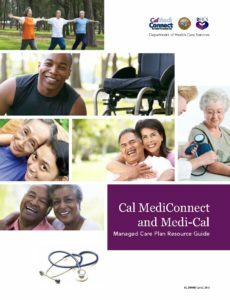 The Cal MediConnect Plan Guidebook will be mailed to individuals approximately 60 days prior to their scheduled date of passive enrollment. These notices have been revised following beneficiary testing and stakeholder comment and will begin mailing to beneficiaries with the 90-day notice in July and remaining notices in August. Notices from DHCS about the Cal MediConnect program will be sent in blue envelopes. Larger envelopes will contain the guidebooks and choice books, while other notices will come in smaller, regular-sized envelopes. Click here to see an example of the larger envelopes. The purpose of the following notifications is to inform current fee-for-service dual eligible beneficiaries, who are not eligible to enroll into a Cal MediConnect plan that they must enroll into a Medi-Cal managed care plan for their Medi-Cal benefits. This notice will include information on which Medi-Cal plan they have been assigned to and other Medi-Cal plan choices. These notices will be mailed to beneficiaries at the specified number of days prior to an individual’s scheduled date of passive enrollment. To enroll in a plan by mail, use the blank Choice Forms available here. If you have Medi-Cal and Medicare, and Medicare covers your doctor visits (also called Medicare Part B), this is the choice book you will receive to choose a Medi-Cal plan for your Medi-Cal benefits. 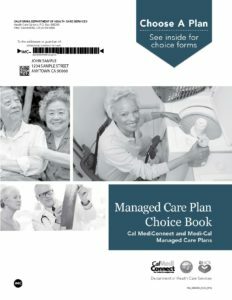 If you only have Medi-Cal, or if you have Medi-Cal and Medicare but your Medicare doesn’t cover your doctor visits, this is the choice book you will receive to choose a Medi-Cal plan for your Medi-Cal benefits. In response to stakeholder input, DHCS has developed two sets of revised MLTSS notices. Beneficiaries will receive one set of notices if they have Medicare Part B and see Medicare doctors or a different set of notices if they do not have Medicare Part B and see Medi-Cal doctors. This notice explains why people eligible for Cal MediConnect receive cancellation notices from their current Medicare Part D plans – because those plans recognize that the person’s drug coverage is scheduled to shift from that current Part D plan to a Cal MediConnect plan instead. They will be mailed out with beneficiaries’ 60-day notices. For more information about the status of CCI notices, including translations, stakeholder comment periods, and dates to finalize. This is the notice beneficiaries will receive if they opt out of Cal MediConnect after receiving their 90-day notice but before receiving their 60-day notice. This is the notice beneficiaries will receive if they opt out of Cal MediConnect after receiving their 60-day notice. This is the notice beneficiaries will receive if they disenroll from Cal MediConnect after their coverage has begun. The San Mateo Non-Auto Enrollment Form will be sent with this notice.